Designed by Paul Alexander, a Ph.D. in Mechanical Engineering and a lifelong knife enthusiast, the Ikuchi (pronounced ee-koo-chee; a mythical Japanese sea monster) is a thoroughly different approach to pocketknife form and function. 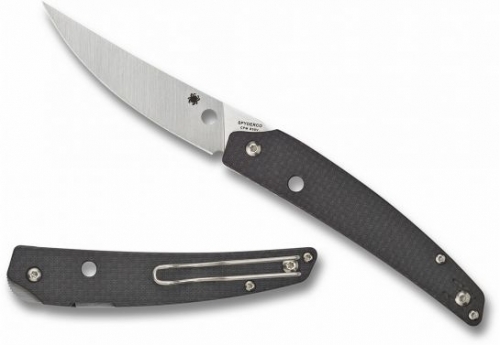 Its elegantly curved handle is crafted with full, skeletonized stainless steel liners and carbon fiber/G10 laminate scales. In the closed position, the handle's slim, open-backed profile completely contains the knife's blade—except for a small textured section of the tang that serves as a flipper opener. With a stroke of an index finger or thumb, the full-flat-ground CPM-S30V stainless steel blade opens and locks securely via Spyderco's patented Compression Lock mechanism. A reversible deep-pocket wire clip completes the package, providing discreet, left or right-side tip-up carry.